This rear wheel drive 2008 Chevrolet Silverado 1500 2WD Ext Cab 143.5" Work Truck features a Dark Blue Metallic Exterior with a Dark Titanium Cloth Interior and has only 144,836 miles. 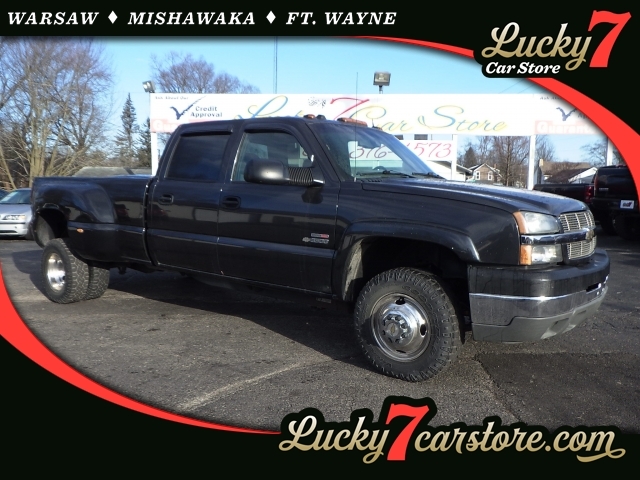 DEALER CONTACT INFO: Call Lucky 7 Car Store of Warsaw today at 574-376-4573 TO SCHEDULE YOUR TEST DRIVE of this 2008 Chevrolet Silverado 1500 2WD Ext Cab 143.5" Work Truck! Lucky 7 Car Store of Warsaw serves Warsaw, Goshen, & Plymouth Car Buyers. You can also visit us at, 222 South Bronson St Warsaw IN, 46580 to check it out in person! Additional Options: Windows, Locks And Mirrors, Power With Uplevel Door Panels On A Base Trim Level Vehicle / Provides Power Driver And Passenger Front Side Windows With Uplevel Door Panels On A Base Level Vehicle. Includes Rpo (dl8) Outside Heated Power-adjustable Manual Folding Mirrors, Rpo (au3) Power Door Locks And Rpo (uq3) Speaker System Audio System Feature. C/k***43-53 Models Include Rear Door Power Windows And Locks. Additional Options: Battery, Single 730 Cca / Provides A 730 Cca Hd Cranking Battery, Replacing The 600 Cca Battery. Additional Options: Horn, High Note / High Note Horn In Addition To The Base Low Note Horn. Additional Options: Label, Fasten Safety Belts / "fasten Safety Belts" Reminder Label On Side Door Window Glass. Additional Options: Spare Tire Delete / Deletes The Spare Tire Only. Spare Wheel And Carrier Remain. Additional Options: Power Supply, 12-volt Direct Power Supply From The Battery / With Two (2) Separate 30 Amp Fused Circuits. Each Circuit Has A 30 Amp Mini-fuse For Both Positive And Ground To Protect Electrical Accessories. Main Supply Lead Has A 60 Amp Maxi-fuse. All Fuses Are Serviceable. Provides Either Direct Battery Power Or Operation Through The Ignition System. Hook-up Wire Is Located At The Front Of The Floor Console. Operational Amperage Is 21 Amps Each Circuit, 42 Amps Total. Hook-up And Operational Instructions Are Provided. Additional Options: Seats, Driver And Passenger Front Individual Seats In Vinyl Trim / Derived From Rpo (ae7) 40/20/40 Split Bench With Center 20% Section Removed. Seats Are Manual, Not Power. Does Not Include Floor Console. Exposed Floor Areas Will Remain Untrimmed. Standard Vinyl Rear Seat With Trim Matching Front Seats Will Be Provided On Extended And Crew Cab Models. Additional Options: Seats, Driver And Passenger Front Individual Seats In Cloth Trim / Derived From Rpo (ae7) 40/20/40 Split Bench With Center 20% Section Removed. Seats Are Manual, Not Power And Include Manual Driver's Side Only Lumbar. Does Not Include Floor Console. Exposed Floor Areas Will Remain Untrimmed. Cloth Rear Seats With Trim Matching Front Seats Will Be Provided On Extended And Crew Cab Models. Additional Options: Paints, Solid, Woodland Green / All Extraneous Body Components Formerly Color-keyed To Body Color, Will Be Flat Black With Seo Paint. Additional Options: Paints, Solid, Doeskin Tan / All Extraneous Body Components Formerly Color-keyed To Body Color, Will Be Flat Black With Seo Paint. Additional Options: Paints, Solid, Wheatland Yellow / All Extraneous Body Components Formerly Color-keyed To Body Color, Will Be Flat Black With Seo Paint. Additional Options: Paints, Solid, Tangier Orange / All Extraneous Body Components Formerly Color-keyed To Body Color, Will Be Flat Black With Seo Paint. Additional Options: Special Paint, Solid, One Color / All Normally Body Colored Non-sheet Metal Parts Will Be Flat Black. No Chrome Front Bumper Bar With Uplevel Trim.